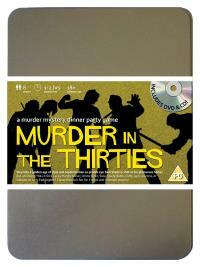 You've been invited to play the role of BOBBY CUFFS in Murder in the Thirties. Who shot Sam Shady? Rooseville, 1931. Sam Shady, private eye to the stars, is celebrating his birthday in style. He’s invited all his current clients, as well as his closest rival, to dinner at his classy house. As his guests are getting to know each other before the first course arrives, Sam steps outside for a quiet smoke and shortly afterwards, he is found lying dead in the middle of his lawn. Find out who made Sam’s birthday go with a bang! Police officer (he’s a stickler for punishment!) Costume : Your blue police uniform lets people know you have authority. This is further reinforced by the handcuffs and truncheon that swing freely from your belt. Large helmet is optional (don’t be shy!). You are a tough and uncompromising police officer, committed to keeping scum off the streets and making Rooseville a safer place to live. You often had contact with Sam Shady as a result of some of the cases he was working on. You hope to soon achieve your lifelong ambition of earning your Detective’s badge.